Chairman Coburn, Ranking Member Carper, and Members of the Subcommittee, I appreciate the opportunity to appear before you today to discuss the tax gap and Internal Revenue Service (IRS) efforts to close it. My statement today is drawn from previous Treasury Inspector General for Tax Administration (TIGTA) reports and testimonies covering the tax gap and IRS compliance efforts, which were done in accordance with government auditing standards, as well as reviews of relevant studies and literature. It is worth noting, that if we were to capture the estimated annual tax gap, it would offset the projected fiscal year (FY) 2006 budget deficit of $260 billion and give us a surplus of approximately $95 billion. Because the tax gap poses a significant threat to the integrity of our voluntary tax system, one of my top priorities for TIGTA is to identify opportunities for improvements to the IRS’ tax compliance initiatives. Similar to nearly all other Federal agencies, the IRS has limited resources to apply to the objectives it seeks to achieve. Nevertheless, the IRS must face the challenge of increasing voluntary compliance and reducing the tax gap. When I testified on the tax gap in July I reported that some of the most challenging barriers to closing the tax gap are tax law complexity, incomplete information on the tax gap and its components, and reduced IRS enforcement resources. To an extent, a portion of the tax gap can be closed through more effective enforcement and a commitment of additional enforcement resources. A significant portion of the gap, however, may not be amenable to traditional examinations and audits. Other means might better address that portion, such as tax law simplification and increased third-party reporting. Some of TIGTA’s more significant findings and recommendations to improve tax administration and help the IRS reduce the tax gap are presented later in my testimony. The IRS describes the tax gap as having three primary components — unfiled tax returns, taxes associated with underreported income on filed returns, and underpaid taxes on filed returns. Within the underreported income component, the IRS has further delineated specific categories of taxes, such as individual, corporate, employment, estate, and excise taxes. In 2006, the IRS updated its estimate of the tax gap, which had been based on data for tax year (TY) 1988. The new estimate was based on data obtained from the National Research Program (NRP) for TY 2001 individual income tax returns. Data from the NRP were used to update the 2001 tax gap figures. 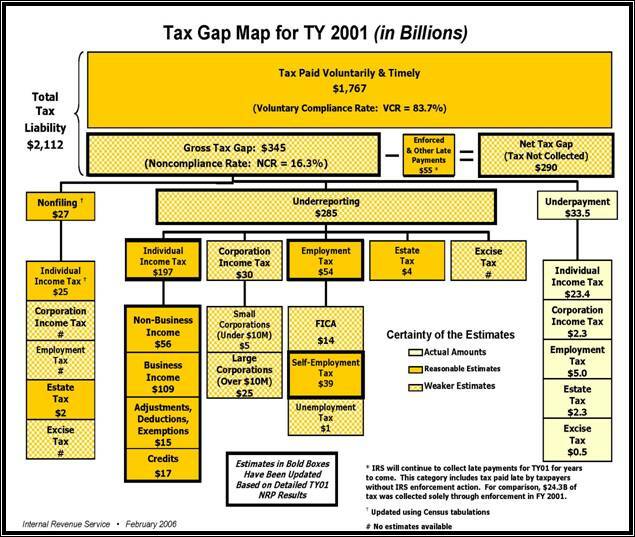 The IRS developed a chart called the tax gap map to graphically depict the gross tax gap for TY 2001, its components, and their relative sizes. The map attributes various certainties to the tax gap estimates, representing the IRS’ confidence in the figures based on the quality and age of the estimates. Figure 1 shows the most recent version of the tax gap map. As shown in the preceding tax gap map, the IRS’ TY 2001 gross tax gap estimate for individual, employment, corporate, and other taxes is $345 billion with a voluntary compliance rate (VCR) of 83.7 percent based on the NRP data. A logical starting point for any discussion about whether a specific VCR goal can be met is an assessment of the reliability of the measurement data. In April 2004, Senator Baucus called for a 90 percent VCR by the end of the decade. Based upon the best information the IRS had available as of February 2006, the gross tax gap for TY 2001 was approximately $345 billion and the VCR was approximately 83.7 percent. Assuming the current IRS tax gap and VCR were complete and accurate, the 90 percent compliance target would present major challenges to tax administration. For example, assuming that in TY 2010 the total tax liability is the same as it was in TY 2001, to reach a level of 90 percent voluntary compliance, noncompliant taxpayers would have to timely and voluntarily pay an additional $134 billion. The IRS has proposed a less aggressive VCR goal of 85 percent by 2009. Regardless of the VCR goal, TIGTA has concerns in all three compliance areas across the major tax gap segments about whether the tax gap projections are complete and accurate. TIGTA’s primary concerns involve the areas of nonfiling, underreporting, and estimated payments that result in the difference between the gross and net tax gaps. Prior to the NRP, the IRS estimated the nonfiling gap to be $30.1 billion, which was composed of $28.1 billion in individual income taxes and $2 billion in estate taxes. In February 2006, the IRS updated this estimate to $25 billion in individual income taxes. The individual estimate was based on data provided by the U.S. Census Bureau. However, there are supplemental data that suggest substantial amounts are not included in the tax gap estimates. For example, the IRS tax gap map describe the nonfiling estimate as reasonable despite the missing segments of corporate income, employment, and excise taxes. The IRS does not have definite plans to update the estate tax segment or to estimate the corporate, employment, and excise tax nonfiler segments, suggesting that the nonfiler estimate is incomplete and likely inaccurate. In July 2004, researchers in the Small Business/Self-Employed (SB/SE) Division issued a report on business nonfilers recommending implementation of an enhanced system for creating and selecting inventory. Subsequently, the SB/SE Division research office developed a prototype that matched $4.6 trillion in transactions to over one-half of the business nonfilers for TY 2002, detecting approximately $1 trillion of apparent taxable income. That fact alone brings the $27 billion individual and estate nonfiling estimate into question and demonstrates the need for more research to better estimate nonfiling for all tax segments. The tax gap attributed to underreporting is by far the largest identified portion of the tax gap at an estimated $285 billion. Yet, TIGTA concluded that this estimate may not be complete since there are at least four areas that suggest substantial amounts are not included in the tax gap map projections. · First, the business income portion of the individual underreporting tax gap estimate is incomplete because it lacks information from another NRP study that the IRS is undertaking on flowthrough returns of Subchapter S corporations. The study, which began in October 2005, will take two to three years to complete. Thus, the information from these audits was not available for the February 2006 updated TY 2001 tax gap estimates. Over 2.9 million Subchapter S Corporation returns were filed in TY 2001 with more than 5.3 million shareholders reporting $187.7 billion in net income. · Second, the tax gap map lists the underreporting gap at $5 billion for small corporations and $25 billion for large corporations. These amounts are essentially carryovers from the previous estimate and are of weaker certainty since no new information was developed. For small corporations, the estimate is based on the 1980 Taxpayer Compliance Measurement Program (TCMP) survey. For large corporate underreporting, the previous estimates were not based on random TCMP audits but on operational audit coverage from the mid-1980s. These projections assume constant VCRs, yet current experience suggests compliance may not be constant. For example, in 2003, an IRS contractor estimated that the yearly tax gap arising from abusive corporate tax shelters alone was between $11.6 billion and $15.1 billion. · Third, the map similarly categorizes as reasonable a $4 billion figure for estate taxes and provides no estimate for excise taxes, yet the estate tax estimate was not updated during the current NRP. In addition, there are no firm plans for further studies or updates of these components. · Fourth, for the employment tax component, the combined $15 billion Federal Insurance Contributions Act and unemployment tax gap figure was also carried over and will not be further studied. Most of the employment tax component consists of self-employment tax. Yet, similar to the business income portion of the individual income tax gap, this, too, is incomplete without the flowthrough data. The IRS’ tax gap maps, both before and after the NRP, list $55 billion as recoveries or enforced collections and other late payments. This figure does not represent an actual amount but is an estimate projected from historical information and formulas based on what is known about the amount of collections on accounts over time. However, TIGTA found the actual basis of these formulas to be very limited, as well as dated. IRS officials acknowledge that these formulas were developed “quite some time ago.” Thus, these formulas most likely do not take into account changes in the IRS’ ability to collect revenue. To determine the validity of the potential $55 billion in collections, TIGTA requested data from the IRS on actual collections for TY 2001 by year of collection. These collections have two basic components: voluntary payments received by the IRS after the due date and payments received by the IRS as a result of some type of IRS intervention. The IRS, however, does not currently correlate either type of payment to the applicable tax year. Consequently, the IRS has no means of determining whether the $55 billion is ever collected. While the IRS is currently developing a way to associate collections resulting from enforcement actions to the related tax years, no similar data are being developed for voluntary late payments. Unless the latter data are similarly correlated, the IRS will be unable to determine actual collections or an accurate net tax gap. In summary, much of the information remains dated, the new information is incomplete in several respects, and methodology differences create challenges. Considering this, a somewhat different picture of the tax gap map emerges. TIGTA has concluded that despite the significant efforts undertaken in conducting the individual taxpayer NRP, the IRS still does not have sufficient information to completely and accurately assess the overall tax gap and the VCR. Although having new information about TY 2001 individual taxpayers is a considerable improvement over the much older information based on the last TCMP survey in TY 1988, some important individual compliance information remains unknown. Additionally, although individuals comprise the largest segment of taxpayers and were justifiably studied first, no new information is available about employment, small corporate, large corporate, and other compliance segments is available. With no firm plans for further studies or updates in many areas of the tax gap, both the underreporting tax gap and the nonfiling gap will indefinitely leave an unfinished picture of the overall tax gap and compliance. While TIGTA has concerns about the overall reliability of the tax gap projections, the annual amounts collected that reduce the net tax gap, and the VCR, TIGTA determined that it was instructive to analyze what additional amounts the IRS would have had to collect to reach 90 percent voluntary compliance at different estimated intervals for TY 2001. Figure 3 shows the range for TY 2001 based upon the total tax liability for TY 2001 as estimated in February 2006. The IRS has proposed in the FY 2007 budget that the VCR will be raised from 83.7 percent to 85 percent by 2009. Accordingly, if the total tax liability remained constant, the IRS would have to collect, on a voluntary and timely basis, $28 billion more in TY 2009, thus reducing the gross tax gap to $317 billion. To reach 90 percent voluntary compliance by TY 2010, the amount voluntarily and timely collected for TY 2010 would be an additional $134 billion, thus reducing the gross tax gap to $211 billion if the total tax liability remained constant. $150 million. According to IRS officials, resource constraints are a major factor in NRP studies and affect how often the NRP is updated. Operational priorities must be balanced against research needs. From FY 1995 through FY 2004, the revenue agent workforce declined by nearly 30 percent while the number of returns filed grew by over 9 percent. This shortfall in examiner resources makes conducting large-scale research studies problematic. FY 2007 requests funding to support ongoing NRP reporting compliance studies. The IRS Oversight Board supports ongoing dedicated funding for compliance research. Unfortunately, funding for those resources in previous fiscal years did not materialize. Without a resource commitment for continual updating of the studies, the information will continue to be stale and less useful in measuring voluntary compliance. · The IRS Strategic Plan needs to be modified to more closely align with the tax gap components. Although better data will help the IRS identify noncompliant segments of the population, broader strategies and better research are also needed to determine what actions are most effective in addressing noncompliance. The IRS must continue to seek accurate measures of the various components of the tax gap and the effectiveness of actions taken to reduce it. This information is critical to the IRS for strategic direction, budgeting and staff allocation. The Department also needs these measures for tax policy purposes. Additionally, Congress needs this information to develop legislation that improves the effectiveness of the tax system. · Increase Resources in the IRS Enforcement Functions. The topic of tax law complexity generally evokes calls for tax law simplification. Government, academic and technical studies suggest a strong correlation between tax law complexity and tax law compliance. The greatest case for the correlation is that complexity allows legal tax avoidance, which at times can evolve into illegal tax evasion. The argument continues that because of tax law complexity, it is often difficult to ascertain whether a taxpayer has intentionally evaded taxes, or whether there was an honest misunderstanding. Therefore, the IRS use of punitive penalties must be tempered to ensure taxpayers are not penalized for honest misunderstandings. The President’s Advisory Panel on Federal Tax Reform cited tax code complexity as a significant problem. Among others, sources of complexity include duplicative and overlapping provisions, phase-outs, and expiring provisions. In addition, the panel cited the instability of the tax code. Since 1986, there have been more than 14,400 changes to the code. This complexity is costing the U.S. economy $140 billion each year, with taxpayers spending over 3.5 billion hours preparing tax returns. More than 60 percent of all taxpayers now rely on a tax practitioner to prepare their tax returns. · Increases the number of inefficient economic decisions. · The effects of the congressional budget process. Experts in tax policy maintain that any tax system will have complexity. Therefore, even though many people believe that tax simplification could provide the impetus for increasing voluntary compliance, a simple tax system could be a very difficult goal to achieve, given the complexities of our society and multiple uses of the Internal Revenue Code. Thus, closing the tax gap through tax simplification and eliminating tax expenditures could prove to be challenging. But, to the extent that the tax law can be simplified, most experts believe that voluntary compliance would improve. Another effective method to increase voluntary compliance might be through greater visibility of transactions. A study by senior IRS researcher Kim M. Bloomquist suggests that beyond the tax law complexity/tax law compliance correlation there may be “trends in the environment that account for the rising tax noncompliance.” According to the study, the presumed rise in tax noncompliance “may be due, at least in part, to a shift in taxpayer income away from more visible to less visible sources.” The study found that income that is not subject to third-party reporting is highest among taxpayers with the highest incomes. For the top 5 percent of taxpayers, unmatchable income as a percentage of Adjusted Gross Income increased by over 98 percent between 1980 and 2000. The IRS has shown that there is a high correlation between tax compliance and third-party information reporting. The difference in compliance rates between individual wage-earning taxpayers and those operating businesses is striking. The IRS has estimated that individuals whose wages are subject to withholding report 99 percent of their wages for tax purposes. In contrast, self-employed individuals who formally operate non-farm businesses are estimated to report only about 68 percent of their income for tax purposes. Even more alarming, self-employed individuals operating businesses on a cash basis report just 19 percent of their income to the IRS. TIGTA believes that a combination of efforts will be required to increase voluntary compliance and reduce the tax gap. Tax simplification and increased transparency through third-party reporting are significant contributing factors toward achieving these goals. The IRS’ National Research Program (NRP) is designed to measure taxpayers’ voluntary compliance, better approximate the tax gap, and develop updated formulas to select noncompliant returns for examination. The first phase of this program addressed reporting compliance for individual taxpayers, and data from this phase were used to produce the updated estimates of this portion of the tax gap. These initial findings should enable the IRS to develop and implement strategies to address areas of noncompliance among individual taxpayers. The next phase of the NRP, which has begun, focuses on Subchapter S corporations (Forms 1120S). TIGTA is currently conducting a review of this phase. These initiatives will allow the IRS to update return-selection models for more effective return selection for its compliance efforts. In 2005, TIGTA reported that the return-selection formulas, developed in the 1980s, only accounted for the selection of 22 percent of the corporate returns selected for examination in FY 2004. Updated selection models should contribute to more effective use of the IRS’ compliance resources. In April 2006, TIGTA recommended that the IRS Commissioner continue to conduct NRPs on a regular cycle for the major segments of the tax gap. TIGTA also recommended that the IRS augment the direct measurement approach, and devise indirect measurement methods to assist in quantifying the tax gap. The IRS agreed with these recommendations, subject to available resources. In addition, TIGTA recommended that the IRS Commissioner consider establishing a tax gap advisory panel that includes tax and economic experts to help identify ways to better measure voluntary compliance. The IRS agreed to look into establishing such an advisory group with the intent of using it to validate and improve estimation methods. Since FY 2000, the IRS’ Small Business/Self-Employed (SB/SE) Division has increased examinations of potentially noncompliant high-income taxpayers. In FY 2005, examinations of high-income taxpayers were at their highest level since FY 1996. As previously noted, the IRS considers high-income taxpayers to be those who file a U.S. Individual Income Tax Return (Form 1040) with Total Positive Income (TPI) of $100,000 or more and those business taxpayers who file a Form 1040 with Total Gross Receipts of $100,000 or more on a Profit or Loss From Business (Schedule C) or on an attached Profit or Loss From Farming (Schedule F). TIGTA recently reported the results of its review of the IRS’ increased examination coverage rate of high-income taxpayers. The increased coverage has been due largely to an increase in correspondence examinations, which limit the tax issues the IRS can address in comparison with face‑to‑face examinations. In addition, the compliance effect may be limited because over one-half of all high-income taxpayer examination assessments are not collected timely. FY 2002 to 1.53 percent in FY 2005. Included in this statistic is an increase in the examination coverage rate of high-income tax returns, Forms 1040 with a Schedule C. This examination coverage rate increased from 1.45 percent in FY 2002 to 3.52 percent in FY 2005. However, as stated earlier, the increase in examination coverage is due largely to an increase in correspondence, rather than face-to-face, examinations. While face-to-face examinations increased by 25 percent from FY 2002 through FY 2005, correspondence examinations increased by 170 percent over the same period. As a result, the percentage of all high-income taxpayer examinations completed through the Correspondence Examination Program grew from 49 percent in FY 2002 to 67 percent in FY 2005. The increase in correspondence examinations for high-income taxpayers who filed a Schedule C was even larger. Examinations closed by correspondence comprised about 30 percent of all high-income taxpayer Schedule C examinations from FY 2002 through FY 2004. In FY 2005, approximately 54 percent of all high-income taxpayer Schedule C examinations were conducted by correspondence. High-income households typically have a large percentage of their income that is not subject to third-party information reporting and withholding. The absence of third‑party information reporting and withholding is associated with a relatively higher rate of underreporting of income among business taxpayers. It is difficult to determine through correspondence examination techniques whether these taxpayers have reported all of their income. In FY 2004, the IRS assessed more than $2.1 billion in additional taxes on high-income taxpayers through its Examination program. This figure includes assessments of $1.4 billion (66 percent) on taxpayers who did not respond to the IRS during correspondence examinations. Based on a statistical sample of cases, TIGTA estimates that approximately $1.2 billion (86 percent) of the $1.4 billion has been either abated or not collected after an average of 608 days — nearly two years after the assessment was made. Our conclusion is that the Examination and Collection programs for high-income taxpayers may not be positively affecting compliance, given the substantial assessments that have been abated or not collected. TIGTA recommended that the IRS complete its plan to maximize the compliance effect of high-income taxpayer examinations. TIGTA also recommended that the plan should include the mixture of examination techniques, issues examined, and collection procedures. The IRS agreed with our recommendations. The taxpaying public has long sought ways to minimize tax liabilities by sheltering income and gains from taxes through investments and other financial-related transactions. Some tax shelters, however, have received widespread publicity because they purportedly abuse the tax law, represent a significant loss of tax revenue, and undermine the public’s confidence in the tax system. The Son of Boss is one such abusive tax shelter. For this abusive tax shelter, the IRS estimated understated tax liabilities in excess of $6 billion. The IRS considers identifying and combating abusive tax shelters extremely important. This priority was reflected in the emphasis given to resolving the Son of Boss abusive tax shelter and ensuring a successful settlement initiative. The IRS publicly announced the settlement initiative in May 2004, and IRS management at all levels closely coordinated the initiative’s implementation to ensure its success. A centralized office was established to receive investor application packages, where they were screened for suitability and forwarded to Examination function groups located throughout the country. Once the packages were received in the groups, examiners were assigned to validate the accuracy of the information on the investor application, determine the amount of out-of-pocket expenses to allow, compute the amount of additional taxes owed, execute a closing agreement, and make arrangements with the investor to pay the taxes owed. Throughout the initiative, interim reports were prepared as a control mechanism to monitor progress and track the cases for both investors participating in the settlement and nonparticipating investors. As of March 16, 2005, IRS interim reports showed 1,039 participating investors had settled their cases by paying or agreeing to pay more than $2.7 billion in taxes, interest, and penalties. TIGTA reviewed the IRS’ efforts and made two observations that the IRS may find useful. First, experience demonstrated that the general three-year statutory assessment period was insufficient for tax administrators to examine and assess all identified participants in the Son of Boss abusive tax shelter. Although it is difficult to precisely estimate the fiscal impact of abusive tax shelters, State officials in California estimated losing between $2.4 billion and $4 billion over four years to various abusive tax shelters. They changed State income tax laws to give California tax administrators up to eight years to assess additional taxes related to abusive tax shelters. Steps were also taken in New York and Illinois to double statutory assessment periods from three years to six years. At the Federal level where the loss from abusive tax shelters has been estimated at $85 billion, a provision in the American Jobs Creation Act of 2004 (AJCA) provided the IRS with up to one additional year to assess taxes related to a “listed” transaction if it is not properly disclosed on the return. Despite the positive, open-ended feature in the AJCA provision, an analysis of 1,958 income tax return examinations of investors in the Son of Boss abusive tax shelter found that the one-year extension does not accurately reflect the time needed to complete the examination and assessment process involved in resolving complex, technical abusive tax shelters. As a result, the one-year extension in the AJCA could prove overly restrictive to realizing intended benefits from the extended assessment period. TIGTA also observed that another possible step the IRS could take is to plan for and conduct an assessment that captures the overall successes achieved and lessons learned in resolving the Son of Boss abusive tax shelter. Such an assessment could provide an important tool for managers if they are again faced with a challenge of this magnitude. In addition, it would be in line with both the Government Performance and Results Act of 1993 and IRS guidance for analyzing program performance and identifying improvement options. In addition, TIGTA recommended that the IRS determine whether the AJCA provision extending the statutory assessment period is adequate to protect tax revenues and deter participation in abusive tax shelters. TIGTA also recommended that the IRS evaluate and document its overall performance in resolving the Son of Boss abusive tax shelter. The IRS agreed with TIGTA’s recommendation to evaluate its overall performance in resolving the Son of Boss abusive tax shelter. The IRS did not agree to take action to determine whether the AJCA provision extending the statutory assessment period is adequate for protecting tax revenues and deterring participation in abusive tax shelters. According to the IRS, more experience is needed before it can determine whether the one-year provision provided by the AJCA is adequate. The IRS may be missing an opportunity to further strengthen its ability to combat abusive tax shelters by not taking action on this recommendation. According to professors Joseph M. Dodge and Jay A. Soled, “An unpublicized problem of crisis proportions is plaguing the administration of the Internal Revenue Code, and it is costing the nation billions of dollars annually. The problem is neither hyper-technical nor hard to discern: On the sale of investments, taxpayers inflate their tax basis and do so with impunity, which results in the underreporting of gains and the overstatement of losses.” In June 2006, the GAO reported that expanding the information brokers report on securities sales to include adjusted cost basis has the potential to improve taxpayers’ compliance and help the IRS find noncompliant taxpayers. The GAO estimates that 38 percent of individual taxpayers with securities transactions misreported their capital gains or losses in TY 2001. According to the GAO, roughly two-thirds of individual taxpayers underreported and roughly one-third overreported. About half of the taxpayers who misreported failed to accurately report the securities’ cost or basis. The lack of information on the basis of investments limits the effectiveness of IRS compliance efforts. Taxpayers report their income much more accurately when there is third-party reporting to the IRS. For the IRS, basis reporting would provide information to verify investment gains or losses, which would allow it to better focus enforcement resources on noncompliant taxpayers. Although basis reporting presents some administrative challenges, the GAO concluded that many of the challenges to implementing basis reporting could be mitigated. Each year, over 40 percent ($130 billion) of the total tax gap is attributable to underreporting among individuals with business income. More than 20 years ago, the GAO recommended that Congress consider requiring withholding and improving information returns reporting for independent contractors. Two years ago, TIGTA recommended that the IRS initiate a proposal for a legislative change to mandate withholding on non-employee compensation payments, such as those provided to independent contractors. Implementing such a provision could reduce the tax gap by billions of dollars. The Joint Committee on Taxation made a proposal to implement withholding on payments from government entities. The proposal recommended withholding 3 percent of payments to businesses and individuals (other than employees) providing goods and services to government entities. This proposal may be a good first step as it would provide an opportunity to test the feasibility and burden associated with such withholding. In addition to implementing withholding on non-employee compensation, other actions should be taken to improve compliance among independent contractors. For example, improvement is needed to address inaccurate reporting of Taxpayer Identification Numbers (TINs) for independent contractors. For TY 1995 through TY 1998, the IRS received about 9.6 million statements for Recipients of Miscellaneous Income (Forms 1099-MISC), reporting approximately $204 billion in non-employee compensation that either did not contain a TIN or had a TIN that did not match IRS records. For any person required to provide a TIN to the IRS, permitting disclosure about whether such information matches records maintained by the IRS might help improve the accuracy of TINs. This would allow a payor to verify the TIN furnished by a payee prior to filing information returns for reportable payments. Additionally, withholding could be mandated for independent contractors who fail to furnish a TIN. Implementing mandated withholding for this segment of independent contractors would result in an estimated $2.2 billion in increased revenue to the IRS each year. TIGTA has also identified improvements that should be made to improve compliance in business tax filing. The GAO reported that more than 60 percent of U.S.-controlled corporations and more than 70 percent of foreign-controlled corporations did not report tax liabilities from 1996 through 2000. Although individual wage earners who receive a Wage and Tax Statement (Form W-2) have their wages verified through a matching program, a similar comprehensive matching program for business documents received by the IRS does not exist. TIGTA has recommended that the IRS evaluate all types of business documents it receives to determine whether this information can be used to improve business compliance. In its response to our recommendations, the IRS wrote that it could not implement this recommendation at that time. However, the IRS also shared its belief that ongoing efforts would provide the results that our recommendation hoped to achieve and asked for the opportunity to continue its efforts. An IRS study, based on TIGTA recommendations, found that in FY 2000, business information documents reported $697 billion in potential taxable income. Furthermore, business information documents identified 1.2 million unresolved IRS business nonfiler tax modules. An IRS tax module contains records of tax liability and accounting information pertaining to one type tax for one reporting period. TIGTA has also reported on issues related to the increasing global economy. Investments made abroad by U.S. residents have grown in recent years, nearly tripling from $2.6 trillion in 1999 to $7.2 trillion in 2003. To address the tax compliance challenges presented by foreign investments, TIGTA recommended that the IRS make better use of the foreign-source income information documents received from tax treaty countries. TIGTA also recommended that prior to issuing refunds to foreign partners, the IRS implement an automated crosscheck of withholding claims against available credits for partnerships with foreign partners. Implementing a comprehensive matching program to identify noncompliance among businesses would be difficult and could require some legislative changes, but it could identify significant pockets of noncompliance among business taxpayers. Taxpayer payment compliance means that the amounts owed are paid on time. However, for decades, the IRS has allowed taxpayers with extended return filing due dates to send in late payments and pay only interest and small failure-to-pay penalties. Obtaining an extension of time to file a tax return does not extend the due date for tax payments, and failure-to-pay penalties are typically assessed when payments are made late, even if the taxpayer has received an extension. In 1993, IRS management eliminated the requirement to pay all taxes by the payment due date in order to qualify for an extension of time to file. Once an extension has been granted, the taxpayer is exempt from a 5 percent per month delinquency penalty for the period of the extension. TIGTA evaluated the impact of these rules on individual and corporate taxpayers and found that 88 percent of untimely tax payments for returns filed after April 15 were attributable to extended-due-date taxpayers. Corporations are required to pay estimates of their unpaid taxes in order to be granted extensions. However, TIGTA found corporate estimates to be highly flawed; in calendar year (CY) 1999 alone, approximately 168,000 corporations received an extension, yet failed to pay $1.8 billion in taxes when they were due. TIGTA projected that the tax gap from extension-related individual income tax underpayments would amount to approximately $46.3 billion in CY 2008, of which approximately $29.8 billion would not be paid until after the end of FY 2008. Due to the more complex nature of corporate taxes, similar figures were not available for corporations, although TIGTA estimated that by TY 2008, approximately $768 million in additional corporate taxes would be timely paid if TIGTA’s recommendations were adopted. The IRS agreed to study TIGTA’s recommendations. According to the IRS’ February 2006 tax gap map, individual and estate tax non-filers accounted for about 8 percent of the total tax gap for TY 2001. Corporate income, estate and excise tax non-filing estimates were not available. The IRS study, together with previous IRS studies, indicates that the tax gap for individual non-filers almost tripled from $9.8 billion in TY 1985 to about $27 billion in TY 2001. In the past, the IRS has had several strategies for reducing the tax gap attributable to individual non-filers. The most recent National Non-filer Strategy, which was developed for FY 2001 through FY 2003, was made obsolete in July 2002 when the IRS was reorganized. Since then, each IRS business division has been responsible for tracking and monitoring completion of its own action items. Consequently, there has been no formal system in place for coordinating and tracking all actions across all IRS divisions. · An increase in the number of cases recommended for prosecution by the Criminal Investigation Division from 269 in FY 2001 to 317 in FY 2004 (an increase of 17.8 percent). However, these were not coordinated activities that were planned and controlled within the framework of a comprehensive strategy. Since FY 2001, each business division has independently directed its own non-filer activities. The IRS did not have a comprehensive, national non-filer strategy or an executive charged with overseeing each business division’s non-filer efforts. TIGTA concluded that the IRS needed better coordination among its business divisions to ensure that resources are being effectively used to bring non-filers into the tax system and ensure future compliance. The IRS also needed an organization-wide tracking system to monitor the progress of each business division’s actions. Without such measurable program goals, the IRS is unable to determine whether efforts to improve program efficiency and effectiveness are achieving desired results. The IRS agreed with all of TIGTA’s recommendations. For FY 2006, the IRS developed its first comprehensive non-filer work plan. The IRS has historically been concerned with employees not reporting tips earned in industries in which tipping is customary. An IRS study showed that the amount of tip income reported in CY1993 was less than one-half of the tip income amount, leaving more than $9 billion in unreported income. As a result, the IRS developed the Tip Rate Determination and Education Program (the Tip Program), which is a voluntary compliance program originally developed in 1993 for the food and beverage industry. It was modeled after the tip compliance agreement used by casinos in the former IRS Nevada District. The Tip Program was extended to the cosmetology industry in 1997 and the barber industry in 2000. Since the Tip Program was introduced, voluntary compliance has increased significantly. In TY 1994, tip wages reported were $8.52 billion. For TY 2004, the amount exceeded $19 billion. To date, over 16,000 employers, representing over 47,000 individual establishments, have entered into tip agreements. Participation in a tip agreement provides benefits for both employees and employers. Assuming that the employer recognizes higher income, employees would be eligible for greater Social Security income, increased unemployment benefits, and workers’ compensation. The increased income would also improve opportunities for approval when applying for loans. If the employer has a retirement contribution plan, there may be additional funding for employees. Once an employee signs a participation agreement, the employee will not be audited on future tips above the agreed tip rate during the agreement period. If an employee does not sign a participation agreement with an employer that has an agreement, the employee will be subject to a possible audit. In May 2001, we issued a report on the Tip Program. Results showed that, while the amount of tip income reported to the IRS had consistently increased, additional enhancements could be made to increase compliance. We recommended that the IRS reemphasize the Tip Program’s importance, provide adequate oversight, ensure proper transfer of the Tip Program from the Employment Tax Compliance function to the new Taxpayer Education and Communication (TEC) function, and expand the Tip Program to other industries in which tipping is customary. We recently followed up on our May 2001 report. Due to the voluntary nature of participation and limited staffing resources, disparity over the number of tip agreements secured in various locations across the country continues to be an issue. The IRS does not plan to actively solicit any new tip agreements beyond the gaming industry in FY 2006. The majority of FY 2006 Tip Program staffing will solicit and monitor tip agreements with the gaming industry and examinations of casino employees. Additionally, multiple realignments affected the transition of the outreach portion of the Tip Program from the Compliance function to the Taxpayer Education and Communication function. The Tip Program has not expanded to the taxi/limousine industry. The IRS has not yet established an automated system to identify business entities required to file an Employer’s Annual Information Return of Tip Income and Allocated Tips (Form 8027). The IRS recently manually matched the Employer’s Quarterly Federal Tax Return (Form 941) data to the database of TY 2004 Forms 8027, identifying 33,685 employers as potential Form 8027 non-filers. However, the Form 8027 database data fields are not always accurate, and only the first quarter of TY 2004 Forms 941 have been matched to this database. Identification of Form 941 non-filing was not prioritized. The IRS has automated the tracking of tip agreements for the food and beverage and cosmetology industries. This automated database is part of a system that is not fully operational but is now funded with a tentative date of FY 2008 for full implementation. However, the gaming tip agreements are maintained in a separate database that does not accommodate all necessary information, preventing consistent use of the information. Also, the Tip Program does not reach some small businesses in the food and beverage industry. The IRS has developed a Revenue Procedure to address this, which the Department of the Treasury approved on July 11, 2006. The IRS plans to test it for three years. A similar Revenue Procedure is needed for small businesses in other industries. We recommended that the IRS ensure that adequate staffing remains available for monitoring tip agreements for all industries and use the results of monitoring to measure compliance; prepare a workforce plan to determine the necessary staffing levels needed to accomplish the Tip Program’s goals; ensure the automated tracking system remains funded and, once fully operational, includes the gaming industry tip agreements. After the Revenue Procedure is tested with the food and beverage industry for one year, we recommended that the IRS consider developing a similar Revenue Procedure for small businesses in other industries. IRS management agreed with our recommendations. In another audit, we determined that since the IRS’ Indian Tribal Government (ITG) Office became operational in FY 2001, the IRS had entered into only 16 agreements with tribal entities for voluntarily reporting casino tip income and had asserted some liabilities on tribal casinos under I.R.C. Section (§) 3121(q). In FY 2001, the ITG Office identified tip reporting as a major compliance issue for tribal governments because of the increase in tribal gaming revenue and because the IRS previously had not had a coordinated effort to interact with tribal governments to ensure compliance with the I.R.C. Although the ITG Office has taken significant actions to improve voluntary compliance by tribal employers and employees, some entities have declined tip rate agreements. We could not determine the impact of the ITG Office’s actions to enforce compliance with I.R.C. §§ 3121(q) and 3401(f) for those entities not voluntarily entering into tip agreements or entities not adhering to the terms of signed agreements. Most enforcement actions started by the ITG Office were still ongoing at the conclusion of our audit. Specifically, since the beginning of FY 2005, the ITG Office had initiated tip examinations related to 13 tribal entities but had completed examinations for only 3 of them. In addition, the ITG Office has not revoked any of the tip agreements between the IRS and tribal gaming entities and has not assessed any liabilities under I.R.C. § 3121(q), which was assigned to the ITG Office in June 2006 for tribal customers. We did not make any recommendations in our report. The Criminal Investigation (CI) Division’s Questionable Refund Program is a nationwide program established to detect and stop fraudulent claims for refunds on income tax returns. The Electronic Fraud Detection System (EFDS) is the primary information system used to support the Questionable Refund Program. In 2001, a contractor was hired to assist the IRS with EFDS operations, maintenance, and enhancements. As of April 24, 2006, more than $37 million had been paid to the contractor for this work, including $18.5 million for system development efforts. Two other contractors were paid approximately $2 million for system development work, bringing the total EFDS system development cost to $20.5 million. The January 31, 2006, business case shows that the EFDS total costs from August 1994 through September 2005 were $185.9 million. In 2002, the IRS initiated an effort to redesign the EFDS to improve system performance, reliability, and availability. The redesigned EFDS web-based application (Web EFDS) was to be implemented in January 2005. Due to system development problems, the implementation date was delayed until January 2006. However, the implementation date was not met. On April 19, 2006, all system development activities for the Web EFDS were stopped, and all efforts were focused on restoring the old EFDS for use in January 2007. Therefore, the IRS was unable to use the EFDS to prevent fraudulent refunds during the 2006 Filing Season. The IRS reported that due to other leads, $93.9 million in fraudulent refunds had been stopped as of May 19, 2006, without the EFDS being operational. While the precise amount of fraudulent refunds is unknown, the IRS reported that more than $412 million in fraudulent refunds had been stopped in 2005. In September 1979, the GAO testified before Congress that “The staggering amount of income, at least $135 billion, on which taxes are not paid is shocking.” The GAO’s testimony focused on actions the Government should take. The recommended actions included ensuring that the level of the IRS’ audit activity did not decline. Unfortunately, while there have been periods of increases in compliance staffing, the IRS has also experienced declines over the years. The combined Collection and Examination functions enforcement personnel declined from approximately 22,200 at the beginning of FY 1996 to 14,500 at the end of FY 2005, a 35 percent decrease. While the President’s FY 2007 proposed budget for tax law enforcement is a slight increase over the FY 2006 budget, the additional funding may not be sufficient to increase enforcement activity above the level provided in the FY 2006 budget. Even though the IRS has started to reverse many of the downward trends in compliance activities, the Collection and Examination functions’ enforcement staffing level is not much higher than the 10‑year low experienced in FY 2003. The numbers in the preceding chart represent the number of Examination function staff conducting examinations of tax returns, excluding management and overhead staff. During FY 2005, revenue agent and tax compliance officer (formerly referred to as tax auditor) staffing decreased, and the combined total is now nearly 35 percent lower than it was at the beginning of FY 1996. The numbers in the preceding chart represent the Collection Field function staffing at the end of each FY 1995 through 2005. The number of revenue officers working assigned delinquent cases, excluding management and overhead staff, decreased slightly during FY 2005 and is nearly 38 percent fewer than at the start of FY 1996. One effect of the lack of resources in the Collection function is that the Queue,  has increased significantly since FY 1996. In FY 1996, the Queue contained more than 317,000 balance-due accounts worth $2.96 billion. In FY 2004, these figures had increased to over 623,000 balance-due accounts worth $21 billion. Additionally, the number of unfiled tax return accounts in the Queue increased from over 326,000 in FY 1996 to more than 838,000 in FY 2004. The number of balance-due accounts “shelved,” or removed from the Queue altogether because of lower priority, has also increased significantly. In FY 1996, less than 8,000 of these balance-due accounts were shelved, but in FY 2004, more than 1 million of these accounts were removed from inventory. From FY 2001 to FY 2004, approximately 5.4 million accounts with balance-due amounts totaling more than $22.9 billion were removed from Collection function inventory and shelved. Additionally, in FY 2004 alone, more than 2 million accounts with unfiled returns were shelved. If increased funds for enforcement are provided to the IRS in upcoming budgets, the resource issues in the enforcement functions will be addressed to some degree. In addition, use of private collection agencies should allow the IRS to collect more outstanding taxes. The IRS will have to be vigilant in overseeing these contractors to ensure that abuses do not occur. However, past experiences with lockbox thefts and insufficient contractor oversight provide valuable lessons toward reducing the likelihood of similar issues occurring when contracting out collection of tax debt. Overseeing the IRS’ private debt-collection initiative is a top priority for TIGTA. TIGTA has coordinated with the IRS during the initial phases of implementation of this initiative by addressing security concerns with the contracts and protection of taxpayer rights and privacy, and by developing integrity and fraud awareness training for the contract employees. TIGTA has also developed a three-phase audit strategy to monitor this initiative and provide independent oversight. There are many areas in which increased enforcement and/or legislative remedies could address noncompliance. For example, a TIGTA audit found that a significant number of single shareholder owners of Subchapter S corporations avoided paying themselves salaries to avoid paying employment taxes. We estimated this would cost the Treasury approximately $60 billion in employment taxes over five years. Under current law, the IRS must perform an examination of these taxpayers to determine reasonable compensation. To accomplish this on any scale would require significant compliance resources. Additional resources might also help the IRS address the growth in fraudulent returns filed by incarcerated individuals. On June 29, 2005, I testified before the House Committee on Ways and Means’ Subcommittee on Oversight about this growing problem. Although prisoner tax returns account for only 0.43 percent of all refund returns, they account for more than 15 percent of the fraudulent returns identified by the IRS. Refund fraud committed by prisoners is growing at an alarming rate. The number of fraudulent returns filed by prisoners and identified by the IRS’ Criminal Investigation function grew from 4,300 in processing year (PY) 2002 to more than 18,000 in PY 2004 (a 318 percent increase). During that same period, all fraudulent returns identified grew by just 45 percent. The IRS’ Fraud Detection Centers screen tax returns based on criteria that identify potentially fraudulent filings. The number of returns screened is based on these criteria and the available resources. During PY 2004, Fraud Detection Centers screened about 36,000 of the approximately 455,000 refund returns identified as filed by prisoners. Resources were not available to screen the remaining 419,000 tax returns. Those returns claimed approximately $640 million in refunds and approximately $318 million of Earned Income Tax Credit (EITC). For those unscreened returns, over 18,000 prisoners incarcerated during all of CY 2003 filed returns with a filing status as “Single” or “Head of Household” and claimed more than $19 million in EITC. Since prisoners were incarcerated for the entire year, they would have had neither eligible earned income to qualify for the EITC nor a qualified child who lived with them for more than six months. Although increasing enforcement is important in addressing the tax gap, the IRS must exercise great care not to emphasize enforcement at the expense of taxpayer rights and customer service. I believe that steps to reduce the current level of customer service should be taken only with the utmost thought and consideration of their impact, and only with all the necessary data to support these actions. Customer service goals must be met and even improved upon, or people will lose confidence in the IRS’ ability to meet part of its mission to provide America’s taxpayers quality service by helping them understand and meet their tax responsibilities. It is unlikely that a massive change in voluntary and timely compliance can be achieved without significant changes to the tax administration system. The IRS faces formidable challenges in completely and accurately estimating the tax gap and finding effective ways to increase voluntary compliance. Strategies have been identified to decrease the tax gap and improvements can be realized; however, sufficient resources are needed to ensure compliance with the tax laws. Mr. Chairman and members of the subcommittee, I appreciate the opportunity to share my views on uncollected taxes and transparency and the work TIGTA has done in this area. I would be happy to answer any questions you may have. Hearings on Bridging the Tax Gap Before the Senate Committee on Finance, 108th Cong. (2004) (statement of Mark Everson, Commissioner of Internal Revenue). This definition and the associated categories have evolved over time. IRS tax gap estimates in 1979 and 1983 included unpaid income taxes owed from illegal activities such as drug dealing and prostitution. The 1988 and subsequent estimates do not include unpaid taxes from illegal activities. Reasons given for excluding are 1) the magnitude of the illegal sector is extremely difficult to estimate; and 2) the interest of the government is not to derive revenue from these activities, but to eliminate the activities altogether. Earlier tax gap figures such as those for 1965 and 1976 only included underreporting. While figures for more recent years (1992, 1995, 1998 and 2001) are more comparable, they are essentially the same estimates adjusted for the growth in the economy. Thus, comparing the figures does not show real growth in the tax gap. Lastly, comparisons among years are not done in constant dollars, so any real growth in the tax gap cannot be determined through this IRS data. This category includes the lesser amounts of overclaimed credits and deductions. Prior to the National Research Program, tax gap estimates were based on the results of the IRS Taxpayer Compliance Measurement Program (TCMP), which was a systematic program of tax return examinations conducted to facilitate the compilation of reliable compliance data. The last TCMP process involved TY 1988 individual income tax returns. The IRS’ goal in its 2007 budget is to reach an 85 percent VCR by 2009. Some Concerns Remain About the Overall Confidence That Can Be Placed in Internal Revenue Service Tax Gap Projections (Reference Number 2006-50-077, dated April 2006). The IRS defines the gross tax gap as the difference between the estimated amount taxpayers owe and the amount they voluntarily and timely pay for a tax year. The portion of the gross tax gap that is not eventually collected is called the net tax gap. Currently consideration is being given to eliminating or reducing the number of people required to pay estate taxes. These include partnerships and Subchapter S corporations through which individual partners and shareholders, respectively, derive tax information from those entities. The flowthrough study covers only Subchapter S corporations and not partnerships. In 1958, Congress established Subchapter S of the Internal Revenue Code that enables small businesses, including sole proprietorships, to form corporations owned by 10 or fewer shareholders. Subsequently, the Code was revised to allow as many as 100 shareholders. Electing this form of business organization, commonly referred to as an S corporation, exempts the profits from corporate taxation and allows the profits to “pass through” to the shareholders who are then responsible for individual income taxes on the profits. The study began in October 2005 with audits of TY 2003 returns. The IRS has not developed a new estimate of this figure. According to one IRS representative, these collections can take up to 10 years because of appeals and court decisions. This is the amount previously described in this report that was called for by Senator Baucus. See Some Concerns Remain About the Overall Confidence That Can Be Placed in Internal Revenue Service Tax Gap Projections, (TIGTA Reference Number 2006-50-077, dated April 2006. Payment of the $55 billion estimated by the IRS as late or enforced payments does not affect the VCR. However, it does affect the total amount collected by the IRS. Therefore, we developed the Eventual Compliance Rate term that shows the effect of these payments when coupled with additional voluntary and timely payments that do affect the VCR. IRS Tax Gap Report: Strategies for Closing the Tax Gap, October 1993, page 3. IRS Tax Gap Report: Strategies for Closing the Tax Gap, October 1993. The President’s Advisory Panel on Federal Tax Reform, Complexity and Instability Staff Presentation (July 20, 2005). For example, inefficient economic decisions are made by taxpayers when they favor one activity over another because of the tax benefit or incentive. Study of the Overall State of the Federal Tax System and Recommendations for Simplification, Pursuant to Section 8022(3)(b) of the Internal Revenue Code of 1986. Trends as Changes in Variance: The Case of Tax Noncompliance, June 2003. Kim Bloomquist states that one of the shifts from matchable to unmatchable income was clearly caused by the stock market bubble of the late 1990’s. A prior shift was seen in from 1980 to 1995 due to the growth in small business income as a percentage of Adjusted Gross Income. See General Accounting Office, supra note 7; Internal Revenue Service, Pub. 1415, Federal Tax Compliance Research: Individual Income Tax Gap Estimates for 1985, 1988, and 1992, (Rev. 1996). Formal, non-farm businesses are considered to be those that are typically not operated on a cash basis and that pay expenses such as taxes, rent, or insurance. These individuals provide products or services through informal arrangements that typically involve cash transactions or “off-the-books” accounting practices. This group includes child care providers, street vendors, and moonlighting professionals. The Small Business/Self-Employed Division Is Beginning to Address Challenges That Affect Corporate Return Examination Coverage (TIGTA Reference Number 2005-30-130, dated August 2005). Statement of Richard L. Fogel, Associate Director, General Government Division Before the Subcommittee on Commerce, Consumer and Monetary Affairs of the House Committee on Government Operations, September 6, 1979. Generally, the TPI is calculated by using only positive income values from specific income fields on the tax return and treats losses as a zero. For example, a hypothetical tax return filed with wages of $90,000, interest of $12,000, and a $25,000 loss from an interest in a partnership would have a TPI totaling $102,000 and be considered a high-income tax return by the IRS. The examination coverage rate is calculated by dividing the number of examined returns in a category by the number of returns in the same category filed in the previous year. While Examinations of High-Income Taxpayers Have Increased, the Impact on Compliance May Be Limited (TIGTA Reference Number 2006-30-105, dated July 25, 2006). Correspondence examinations are important compliance activities focusing on errors and examination issues that typically can be corrected by mail. They are conducted by sending the taxpayer a letter requesting verification of certain items on the tax return. These examinations are much more limited in scope than office and field examinations in which examiners meet face to face with taxpayers to verify information. TIGTA selected the sampled cases from those completed in FY 2004 to provide sufficient time for collection activities. Margin of error + 5.05 percent. Abatement occurs when the IRS reduces an assessment, in this case from reversing examination findings that had uncovered apparent misreported income, deductions, credits, exemptions, or other tax issues. The Son of Boss (Bond and Option Sales Strategies) tax shelter was a highly sophisticated, technically complex, no-risk scheme designed to generate tax losses without corresponding economic risks. It was promoted by some prominent firms in the financial services industry to investors seeking to shelter large gains from the sale of a business or capital asset. The scheme used flowthrough entities, such as partnerships, and various financial products to add steps and complexity to transactions that had little or no relationship to the investor’s business or the asset sale creating the sheltered gain. Additionally, the losses generated from the transactions were often reported among other “legitimate” items in several parts of the income tax return. Some losses, for example, were reported as a reduction to gross sales, cost of goods sold, or capital gains. Out-of-pocket expenses are transaction fees that were typically paid by investors to promoters. The Settlement Initiative for Investors in a Variety of Bond and Option Sales Strategies Was Successful and Surfaced Possible Next Steps for Curtailing Abusive Tax Shelters (TIGTA Reference Number 2006-30-065, dated March 2006). Internal Revenue Service: Challenges Remain in Combating Abusive Tax Shelters (GAO-04-104T, dated October 2003). Pub. L. No. 108-357, 118 Stat. 1418 (2004). A listed transaction is the same as or substantially similar to one of the types of transactions the IRS determined to be a tax avoidance transaction and identified by notice, regulation, or other form of IRS published guidance. Pub. L. No. 103-62, 107 Stat. 285 (codified as amended in scattered sections of 5 U.S.C., 31 U.S.C., and 39 U.S.C.). Joseph M. Dodge is the Stearns Weaver Miller Weissler Alhadeff & Sitterson Professor at Florida State University College of Law. Jay A. Soled is a professor at Rutgers University. Joseph M. Dodge and Jay A. Soled, ‘‘Inflated Tax Basis and the Quarter-Trillion-Dollar Revenue Question,’’ Tax Notes, January 24, 2005. Capital Gains Tax: Requiring Brokers to Report Securities Cost Basis Would Improve Compliance if Related Challenges Are Addressed (GAO-06-603, dated June 2006). 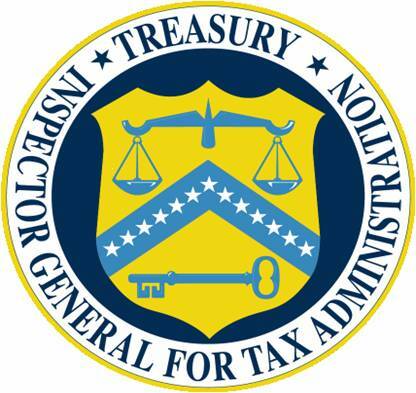 While Progress Toward Earlier Intervention With Delinquent Taxpayers Has Been Made, Action Is Needed to Prevent Noncompliance With Estimated Tax Payment Requirements (TIGTA Reference Number 2004-30-040, dated February 2004); Significant Tax Revenue May Be Lost Due to Inaccurate Reporting of Taxpayer Identification Numbers for Independent Contractors (TIGTA Reference Number. 2001-30-132, dated August 2001). Staff of the Joint Committee on Taxation, 109th Cong., Options to Improve Tax Compliance and Reform Tax Expenditures (Comm. Print 2005). S. 1321, Telephone Excise Tax Repeal Act Of 2005. The IRS Should Evaluate the Feasibility of Using Available Documents to Verify Information Reported on Business Tax Returns (TIGTA Reference Number 2002-30-185, dated September 2002). General Accounting Office, Pub. No. GAO-04-358, TAX ADMINISTRATION: Comparison of the Reported Tax Liabilities of Foreign- and U.S.-Controlled Corporations, 1996-2000 (2004). The IRS receives over 30 different types of business information documents yearly. Most of these forms have a legal requirement for issuance to corporations. The three information documents most often issued to business nonfilers are Forms 1099-B (Proceeds from Broker and Barter Exchange Transactions), 1099-MISC (Miscellaneous Income), and 4789 (Currency Transaction Reports). Internal Revenue Service, Report of BMF IRP Nonfilers for TY 2000 (Corporations, Partnerships, and Trusts), Research Project 02.08.003.03, SB/SE Research (July 2004). Stronger Actions Are Needed to Ensure Partnerships Withhold and Pay Millions of Dollars in Taxes on Certain Income of Foreign Partners (TIGTA Reference Number 2001-30-084, dated June 2001); Compliance Opportunities Exist for the Internal Revenue Service to Use Foreign Source Income Data (TIGTA Reference Number 2005-30-101, dated July 2005). The Delinquency Penalty is also known as the Failure-to-File Penalty, although it only applies to taxpayers who both file late and fail to pay all taxes by the tax payment deadline. The Regulations for Granting Extensions of Time to File Are Delaying the Receipt of Billions of Tax Dollars and Creating Substantial Burden for Compliant Taxpayers (TIGTA Reference Number 2003-30-162, dated August 2003); Changes to the Regulations for Granting Extensions of Time to File Corporate Returns Are Needed to Alleviate Significant Problems With Administering the Tax Laws (TIGTA Reference Number 2004-30-106, dated June 2004). The non-filer tax gap is the dollar amount of taxes not paid timely on delinquent and non-filed returns. The estimated tax gap of $27 billion in TY 2001 was composed of $25 billion for individual income tax non-filing and $2 billion associated with estate and gift tax. The estimate is developed from other tax gap data sources and is not derived from direct data sources. So, the growth in the dollar amounts in the estimate track the increases in other tax gap estimates. The Internal Revenue Service Needs a Coordinated National Strategy to Better Address an Estimated $30 Billion Tax Gap Due to Non-filers (TIGTA Reference Number 2006-30-006, dated November 2005). The Automated Substitute for Return Program focuses on high-income taxpayers who have not filed individual income tax returns but appear to owe significant income tax liabilities based on available Information Reporting Program information. The campuses are the data processing arm of the IRS. They process paper and electronic submissions, correct errors, and forward data to the Computing Centers for analysis and posting to taxpayer accounts. Internal Revenue Code Section 6020(b) (2005) provides the IRS with the authority to prepare and process certain returns for a non-filing business taxpayer if the taxpayer appears to be liable for the return, the person required to file the return does not file it, and attempts to secure the return have failed. Opportunities Exist to Improve the Tip Rate Education and Determination Program (Reference Number 2001-30-076, dated May 2001). Additional Enhancements Could Improve Tax Compliance of Employees Who Receive Tips (Reference Number 2006-30-132, dated September 15, 2006). Form 8027 is an information return filed by large Food and Beverage establishments when the employer is required to make annual reports to the IRS on receipts from food or beverage operations and tips reported by employees. Generally, a large employer is one who employs more than 10 employees on a typical business day. The Indian Tribal Governments Office’s Administration of the Tip Compliance Program for Its Customer Base Increased Voluntary Compliance (Reference Number 2006-10-131, dated September 8, 2006). I.R.C. § 3121(q) (2005) allows the IRS to assess the employer’s share of taxes with respect to unreported tips under the Federal Insurance Contribution Act, I.R.C. §§ 3101-3128. I.R.C. § 3401(f) (2005) relates to tips received by employees in the definition of “wages” for purposes of employment taxes. If it is determined that a tribe is not adhering to the terms required in its tip agreement, revocation of that agreement should be considered. Because participation in the Tip Program is voluntary, revocation should be a last resort. The Electronic Fraud Detection System Redesign Failure Resulted in Fraudulent Returns and Refunds Not Being Identified (Reference Number 2006-20-108, dated August 9, 2006). Collection and Examination function staff located in field offices, excluding management and overhead staff. An automated holding file for unassigned inventory of lower priority delinquent cases that the Collection function does not have enough resources to immediately assign for contact. High-Risk Work Is Selected From the Unassigned Delinquent Account Inventory, but Some Unassigned Accounts Need Management’s Attention (Reference Number 2006-30-030, dated February 2006). Federal Requirements Need Strengthening at Lockbox Banks to Better Protect Taxpayer Payments and Safeguard Taxpayer Information (TIGTA Reference Number 2002-30-055, dated February 2002); Insufficient Contractor Oversight Put Data and Equipment at Risk, (TIGTA Reference Number 2004-20-063, dated March 2004). Actions Are Needed to Eliminate Inequities in the Employment Tax Liabilities of Sole Proprietorships and Single-Shareholder S Corporations (TIGTA Reference Number 2005-30-080, dated May 2005). Hearing to Examine Tax Fraud Committed by Prison Inmates, 109th Cong. (2005) (statement of J. Russell George, Inspector General) and The Internal Revenue Service Needs to Do More to Stop the Millions of Dollars in Fraudulent Refunds Paid to Prisoners (TIGTA Reference Number. 2005-10-164, dated September 2005). Processing year refers to the year in which taxpayers file their returns at the Submission Processing Sites. Generally, returns for 2003 were processed during 2004, although returns for older years were also processed.